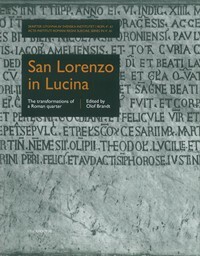 This volume presents the results of research carried out by the Swedish Institute in Rome in the Roman church of San Lorenzo in Lucina. This research involved the Roman phases of the site and the surrounding quarter. The research began with the 1993-1998 excavation of the baptistery of the Early Christian church, and continued in 2000 with a project which also included other parts, aspects and periods of the site. The papers in this volume shed new light on the Late Roman and post-Antique development of an area which is between Augustan monuments such as the Ara Pacis, the Mausoleum of Augustus, the obelisk and its meridian. The papers include studies on the early 3rd century insula beneath the church, the baptistery and the Early Christian basilica, as well a survey of hagiographic legends, medieval wall-paintings, and other finds such as inscriptions and graffiti, pottery, glass, marble, bones and spolia. Reports on the conservation on fragments of Roman wall-paintings and marble fragments are also included.